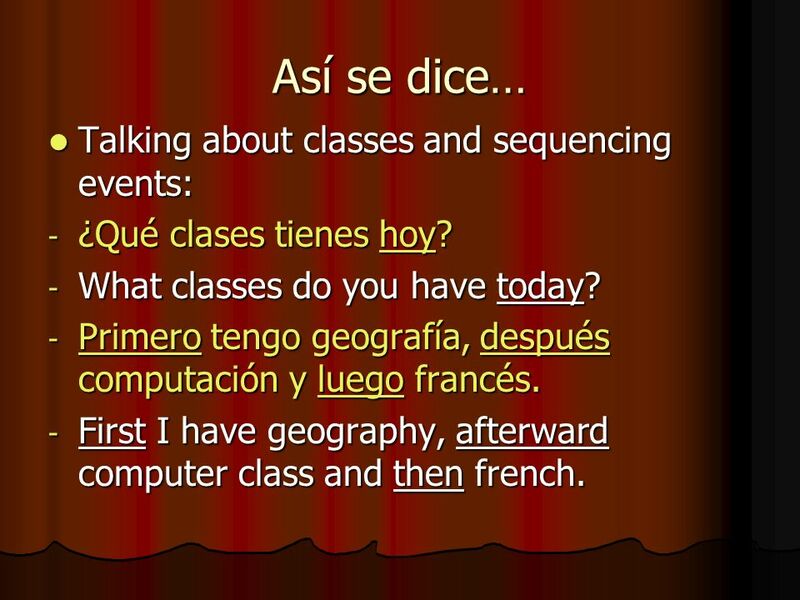 Objectives: We will be able to talk about classes and sequence events and tell time. 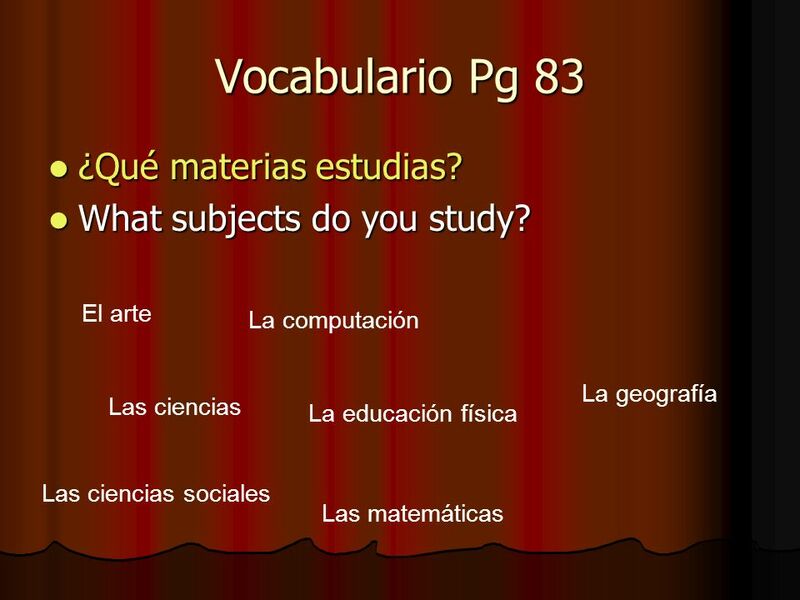 2 Vocabulario Pg 83 ¿Qué materias estudias? What subjects do you study? 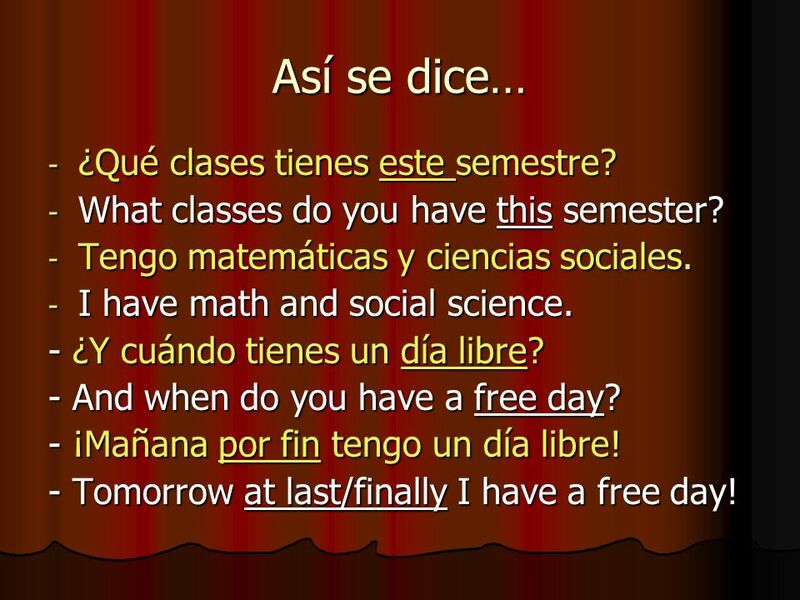 ¿Qué clases tienes hoy? What classes do you have today? Primero tengo geografía, después computación y luego francés. First I have geography, afterward computer class and then french. 4 Así se dice… ¿Qué clases tienes este semestre? What classes do you have this semester? Tengo matemáticas y ciencias sociales. I have math and social science. - ¿Y cuándo tienes un día libre? - And when do you have a free day? - ¡Mañana por fin tengo un día libre! - Tomorrow at last/finally I have a free day! 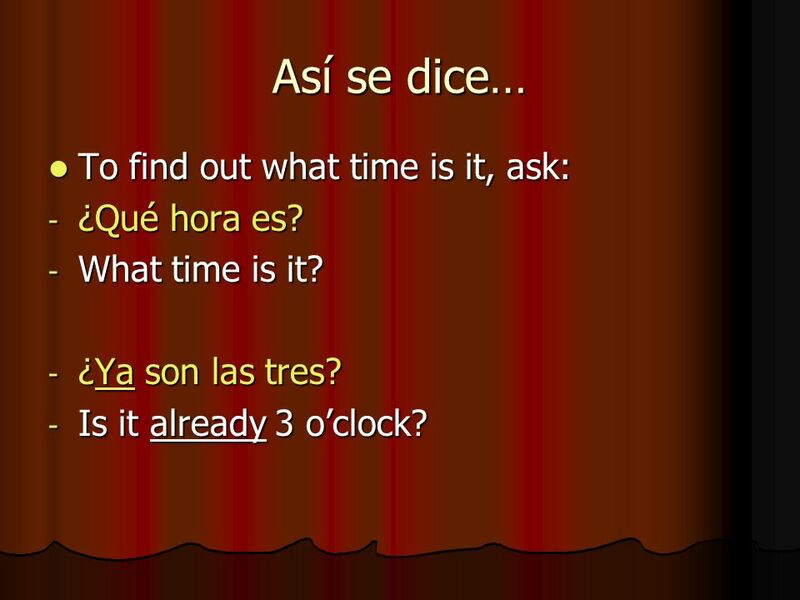 5 Así se dice… To find out what time is it, ask: ¿Qué hora es? ¿Ya son las tres? Is it already 3 o’clock? 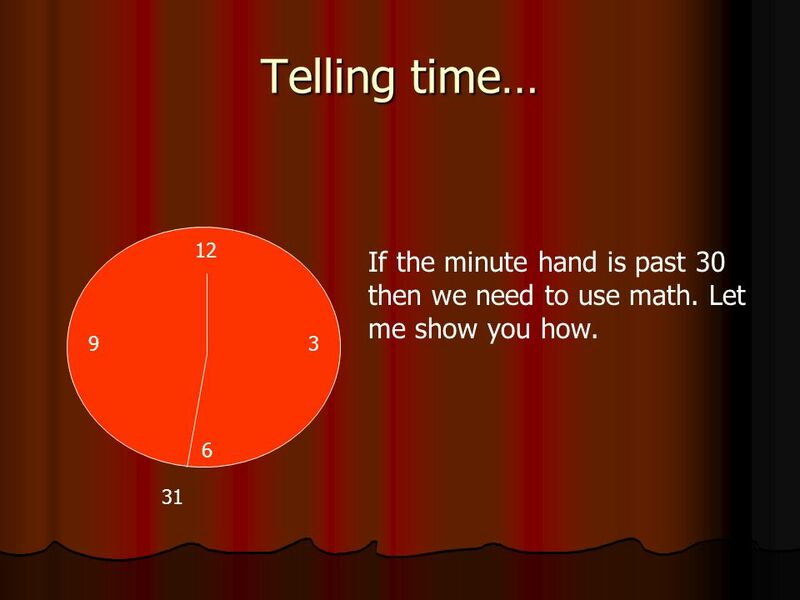 8 Telling time… Have you ever heard someone say it is a quarter ‘til 3? What time is it then? It is 2:45. Right? Well in Spanish we use that too. For example: 3:40 How many minutes until the next hour? 20 minutes. So we could say that it is 4 minus 20 minutes, right? That’s how we do it! 9 Telling time… So, if it 3:35 that means that we have 25 minutes until 4. So we would say it is 4 minus 25. MENOS => MINUS If someone asks the time: 3:35 Son las cuatro menos veinticinco. 1:50 Son las dos menos diez. 12:55 Es la una menos cinco. 7:43 Son las ocho menos diecisiete. For one we always say unA. 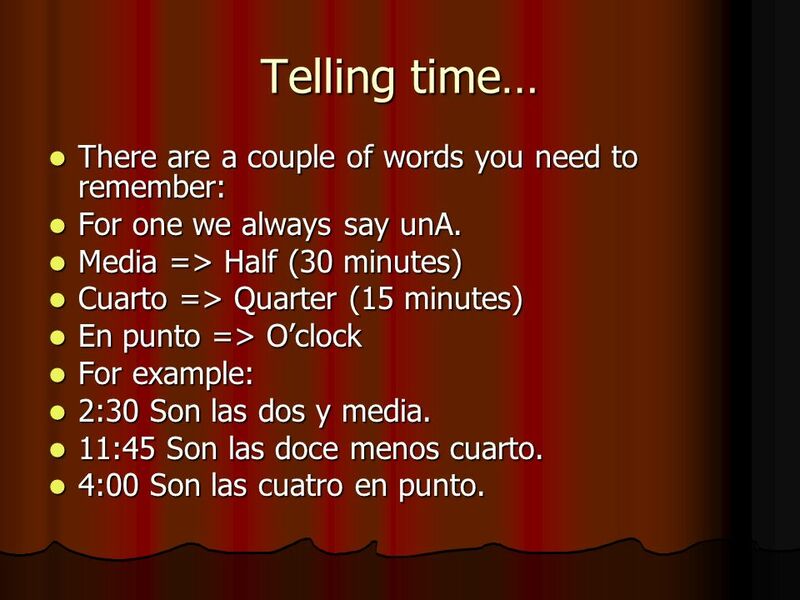 Media => Half (30 minutes) Cuarto => Quarter (15 minutes) En punto => O’clock For example: 2:30 Son las dos y media. 11:45 Son las doce menos cuarto. 4:00 Son las cuatro en punto. Es la una y veinte. 9:45 Son las diez menos cuarto. 5:50 Son las seis menos diez. 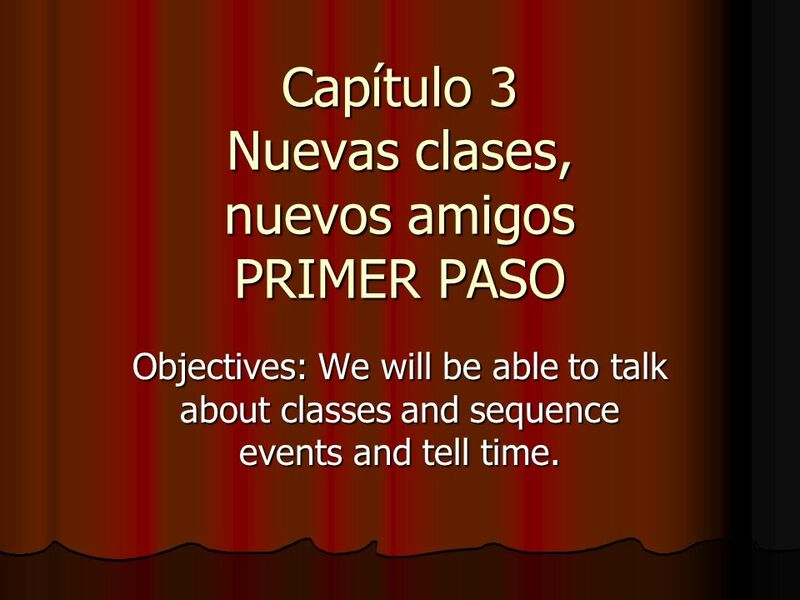 Descargar ppt "Capítulo 3 Nuevas clases, nuevos amigos PRIMER PASO"
¿Qué hora es?. 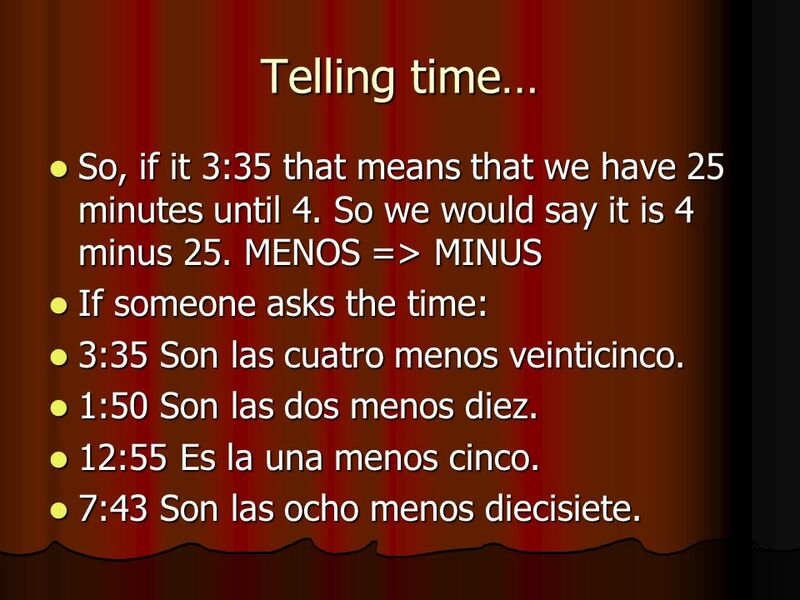 When you tell time in Spanish you use es when it is one oclock and son when it is any other number/hour. It is one oclockEs la una. It. Los Números y El Tiempo. Los Números Más de = once 12 = doce 13 = trece 14 = catorce 15 = quince 16 = dieciseis 17 = diecisiete 18 = dieciocho 19. 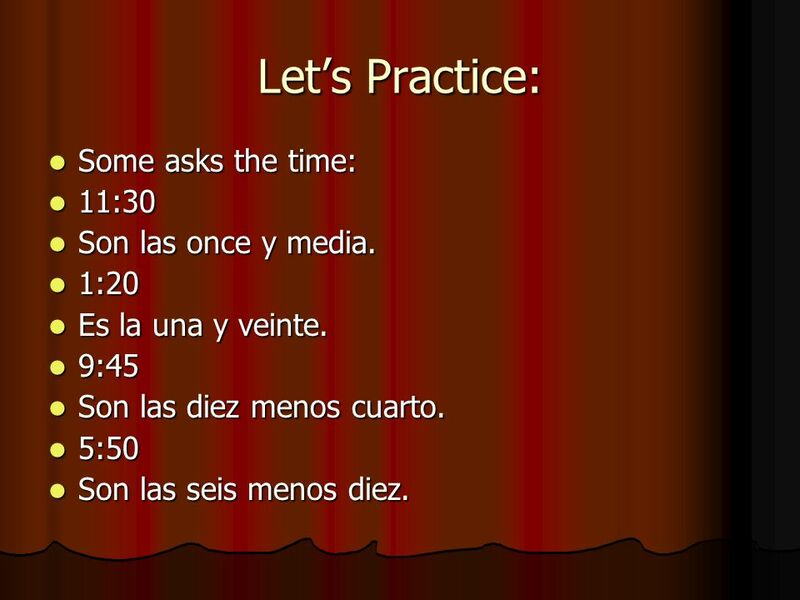 You need to improve the way you write and think in Spanish - Time This is an interactive presentation. You need your work sheet, your pencil, and your. You need to improve the way you write and think in Spanish – At what time? This is an interactive presentation. You need your worksheet, your pencil, and. Sñta Ferreira El 3 de febrero LA HORA EN ESPAÑOL. La hora. ¿Qué hora es? Son las ocho= Its 8 oclock Son las ocho= Its 8 oclock Son las cinco= It's 5 oclock Son las cinco= It's 5 oclock Son las seis=Its. 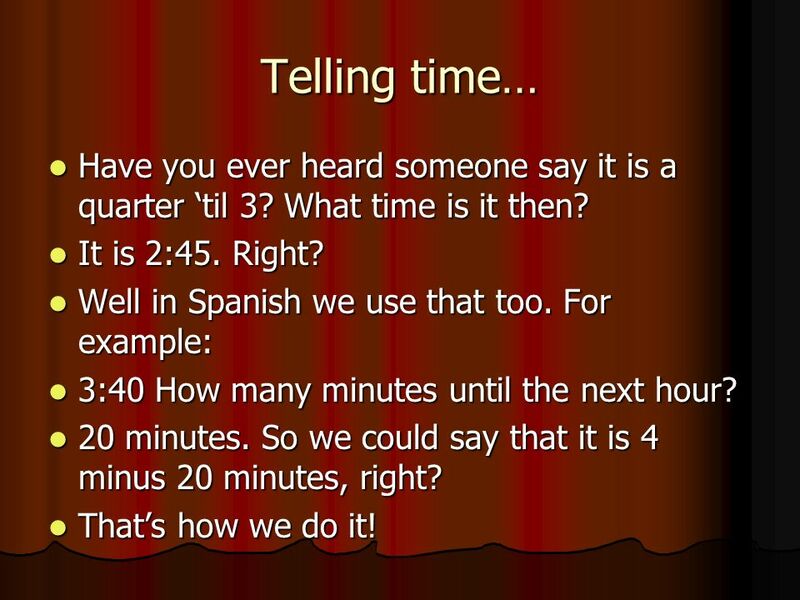 Telling Time in Spanish ¿Qué hora es?. To ask what time is it, you say: ¿Qué hora es? ¿Qué hora es? Spanish 2-2 By: Thomas Hanrahan Jasmine Lee. The verb ir Ir means to go Yo form: voy Tú form: vas Ella usd. Él form: va Nosotros form: vamos Vosotros. ¿Qué hora es? Sra. Lear Unidad 2 Etapa 2. Para Empezar Hoy en lunes el veintinueve de octubre Write the times below in Spanish. 2:59- 9:31- 10:04- 5:17- Answer the question below (look at the clock. 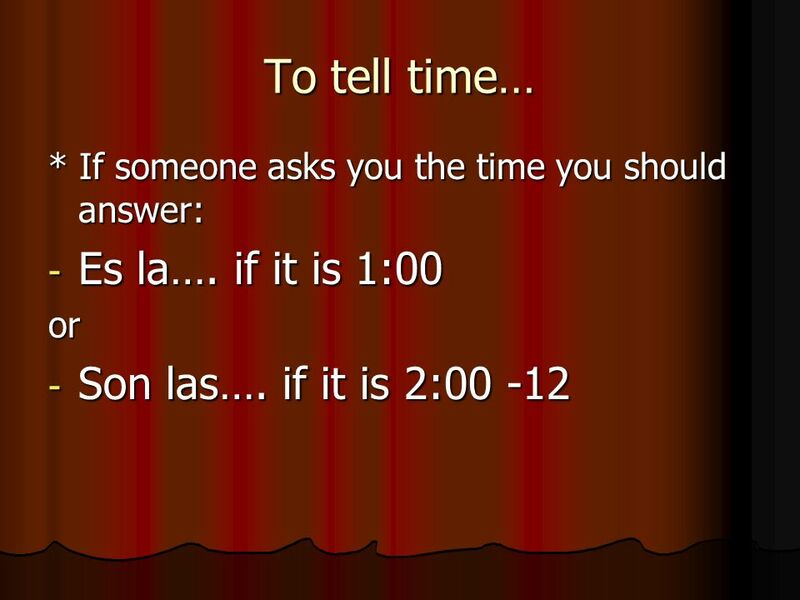 Telling Time Español 1. Asking about time ¿Qué hora es? REPASO: Plural Definite Articles Masculine los Ex: los cuadernos Feminine las Ex: las camas.